In the last few years there has been a very welcome addition to the unique genre of literature called the gedolim biography. I’m referring to translations of unusually intimate and detailed biographies, previously only available in Hebrew, of modern gedolim such as the Brisker Rav, HaRav Menachem Man Shach zt”l, and biographical sketches of other 20th century giants. The enthusiasm, and controversy, about these books once again raises the challenging issue, however, of how we are to interact with this sort of work — intellectually, emotionally and spiritually. This choice of terminology is not meant as a criticism, as it is often used when describing insufficiently critical biographical works. Rather the premise of the gedolim biography is entirely the same as that of hagiography: The subject is a person entitled to, and granted by the presumptive readership, elevated reverence due to his spiritual accomplishments. The purpose of the work is to celebrate these and to inspire readers and teach by explaining how a person who walked so closely with God did so, so that we can emulate or otherwise learn from those ways. While it is true that a journalistic or “objective” biography can, by virtue of showing a “warts and all” portrait of its subject, sometimes be even more inspiring than a hagiography — especially because of its arguably more practical application — our sensibililty, as observant Jews, does not admit of that option. For people such as myself who come from a secular background, and who may have honed their intellectual or analytical skills through one or more courses of university study, this last assertion requires some serious analysis and thought. We always must satisfy ourselves as to whether we are, after all, in a “comfort zone” intellectually, based on the hard-wired person we are today, or whether we are entering the realm of “believe this,” as opposed to “know this.” All of us have passed into the latter territory on this journey, but it is not granted to just anything, or anyone, and should not be. To some extent I have wrestled with this issue before here, in this article, where we all discussed anti-religious blogging by Jews and in this essay-length comment to this fine Steve Brizel post. And I also wrote a while back about the challenges of Judaica publishing, and purchasing. It is not because I consider myself so citable, but rather because I don’t want to be accused of needless repetition, that I keep linking to these earlier musings; more importantly, these are all related: How we reach a point where following the instructions in the “how to” books and the halacha works and the Artscroll Siddur only get us so far. We want to know what’s next, how do we do more, what does it look like? And we don’t, most of us, have either parents or ancestors or even access to a personal oral tradition about what it might look like, for us, at “more” in this particular manner. So because we are, as has been said by many more scholarly than I, in the post-oral-tradition era and rely instead on written works, we turn to books about acclaimed people because we want to populate our internal personal galleries of personal exemplars of avodas Hashem [service to G-d] the highest order. It is worth examining the premise of the modern-day concept of the “tell-all” biography in the first place. We start with the axiom that not everything ought to be said, much less written, much less published. More specifically, there is no question that we learn “more” from a “warts and all” biography, but it is far from clear that we learn better. It is said, or was said before it became so utterly anachronistic, that no man is a hero to his valet. Yet it is not the person who has the most “intimate” knowledge of a person’s least dignified, least elevated functions who has the most to tell us about who that person is — for in fact the most prosaic aspects of a person’s life are the ones that are the least distinguishing. We all know why Pharoah went down to the Nile in the morning, and notwithstanding the official story, surely his courtiers did as well. The pretense “worked” for all involved. And while in contrast halacha does not promote falsehood about the natural order of life and living, we still forbid a disciple from beholding his master in an undignified state, and so too a child his parent, and a subject his king. We don’t learn about a person by reading his entrails or his fingernail clippings or his laundry list — fine. On the other side of the issue, fawning, starry-eyed treatment that turns a life of high achieviement and complexity into a facile fairy tale is of limited value. Not no value at all: For BT’s, at least, they still provide a basic narrative outline of stuff we didn’t learn growing up — names, dates, places — that is no less useful, and is probably more so, than the other accepted narratives (say, l’havdil [pardon the comparison] about the Pilgrims, Abe Lincoln, Babe Ruth) we learned about the world growing up. There are worse things to keep on your nightstand. The more recent books, including some originally written in English, are better than many of the early entries, in part because people, perhaps people such as ourselves, demand more from our literature. They are increasingly well sourced, and while they respect considerations of dignity and reverence, they acknowledge the existence of the world around their subjects, as well as the fact that not all the gedolim being biographed agreed with each other about every little thing. Indeed, if you line all these narratives up in a mental spreadsheet, you can, reading between the lines, figure out a thing or two about what’s “really” being said. Then you have a starting point, and can seek information and guidance about from people who might be able to elucidate the issues and personalities more candidly, or from a different perspective. There are still some serious flaws in virtually all such biographies. One important one is the lack of acknowledgment of the biographical importance of a gadol’s spouse and other non-talmud-chacham family members. Notwithstanding understandable concerns of privacy and tzenius [modesty and dignity], this consistent omission presents an incomplete picture of the life of such great men and indeed of Jewish life and human life in general. Not surprisingly, from what I am told, these omissions leave some female readers cold too. But there is hope. In particular, the first half (the only half translated so far) of Rav Asher Bergman’s biography on Rav Shach represents a very substantial step in the right direction on this score. It will be interesting to see if the second volume addresses some important and meaningful issues (some of which even BT’s know enough about to be looking for) in the life of this great man. And at the end of the day, that is the thing: By these books, I have a sense of a kind of greatness I would not otherwise know. It helps me to appreciate how these gedolim have shaped communal values, made our present-day leaders who they are and, to some extent, how we’ve gotten into some of the pickles we’re in. You can’t believe anything you read, if it’s not the Torah — even if it’s about the men who lived and taught Torah. But a mature appreciation of gedolim biographies can lead to a mature appreciation of who we are today and what a person can achieve in this world and the next. That’s why I read them. Two hundred years after his passing in 1809, the influence of Rabbi Levi Yitzchak of Berditchev on chassidim and non-chassidim alike shines stronger than ever. His magnum opus “Kedushat Levi” is now available in English translation and continues to grip the hearts and imaginations of those who drink from it. Study groups to plumb the depths of this accessible yet enigmatic chassidic classic have proliferated worldwide. Wherein lies the secret to his ever increasing popularity? It took a high school English literature course to provide an important clue. Several years ago my daughter took a survey course in English literature. At first she was enthralled with the literary tapestries woven by such greats as Hemingway, London, Faulkner and others. Yet when she discovered the sordid details which punctuated many of their lives – the abuse, the misogyny, alcoholism and even suicide – her ardor rapidly waned as she grappled unsuccessfully with the dissonance between their lives and their art. It is not surprising that his legacy is perpetuated and transmitted via the many uplifting stories about his life She slowly came to the realization that the true hallmark of personal greatness is an ability to inspire as much by what one does as by what one says or teaches. Rabbi Levi Yitzchak’s life personifies such a seamless synthesis of thought, speech, action and appearance. Accordingly, it is not surprising that his legacy is perpetuated and transmitted via the many uplifting stories about his life and his tenacious advocacy on behalf of the Jewish people as well as through his Torah teachings. The founder of the chassidic movement, Rabbi Israel Baal Shem Tov (1698-1760), and his successor Rabbi Dov Ber (“The Great Maggid”) of Mezritch (d. 1773), did not leave much of a written legacy detailing their newly revealed path to the service of G‑d. Rather, it was several of the Maggid’s closest disciples who began to put to writing the spiritual infrastructure of the nascent movement. Rabbi Elimelech from Lyszansk authored a work entitled Noam Elimelech, “The Pleasantness of Elimelech,” and several decades later Rabbi Levi Yitzchak, affectionately known as “the Berditchever,” composed the essays which were to become the Kedushat Levi, “The Holiness of Levi.” Similarly, Rabbi Schneur Zalman of Liadi, the founder of Chabad chassidism, drafted a series of pamphlets that collectively became known as the Tanya (named after the words with which the book begins). Whereas the Tanya is directed at the beinoni (“intermediate,” or average individual), the former two works are apparently veritable how-to manuals for the tzaddik (organically righteous soul). Still, one gets the feeling that the level of tzaddik described in the Kedushat Levi is eminently reachable – with much effort to be sure – but that the Berditchever characteristically set the bar ever-so-slightly higher so as to offer a built-in defense to the heavens on behalf of those whose aspirations exceed their actions. Where others saw visions, analogies and similes, the Berditchever saw only realityRabbi Levi Yitzchak was a true spiritual visionary of the highest order. One of his seminal teachings involves Shabbat Chazon (literally “the Shabbat of Vision”)—the Shabbat preceding the Ninth of Av, the date upon which the destruction of the first and second Temples is commemorated. Ostensibly, the name is derived from the first words of the day’s haftorah portion, “Chazon Yishayahu”—”the vision of Isaiah.” The Berditchever, however, taught that on Shabbat Chazon, every Jew is vouchsafed a vision of the third Temple. To Rabbi Levi Yitzchak, this “vision” was not merely a paranormal projection, hallucination or hologram; it was a glimpse of the actual Temple in koach (a state of potential), waiting for us only to bring it to a state of “poal” (concrete actualization). Similarly, in his Likkutim – a series of passionate vignettes homiletically analyzing various biblical verses – he explains a seeming redundancy in the book of Joel (2:26), which employs the words “and you shall eat” twice. He explains rather cryptically that the first use refers to the fabled “Feast of the Leviathan” which according to him the Jewish people have already eaten in the guise of Shabbat and Festival meals, while welcoming guests and partaking in other meals associated with the performance of a mitzvah. To him, the double phrase suggests that in messianic times, the Jews will again be rewarded with the feast of the Leviathan as they have already eaten it! Where others saw visions, analogies and similes, the Berditchever saw only reality. Rabbi Levi Yitzchak’s teachings reflect the idea that every human being has two eyes. First there is “the good eye.” And then there is “the other good eye” (reminiscent of the magician at the children’s party who asked a volunteer for his right hand. When the child proffered his left one, the magician quickly said, “No, your other right hand”). Concededly, it was the “other” eye, but Rabbi Levi Yitzchak – ever true to the teachings of the Maggid and the Baal Shem Tov – emphasized repeatedly that even in that state of “other,” good could be found. Rabbi Levi Yitzchak’s starting point was his ability to see life through “the good eye,” a default position if you will. If he saw a Jew wearing tefillin while ignominiously greasing the axles of his wagon, he would smile, look up to the heavens and proudly proclaim to G‑d the greatness of the Jewish people who even when engaged in mundane worldly pursuits such as greasing their axles, nevertheless called out to G‑d in prayer. Similarly, stories of the Berditchever find him wandering through the market place on the eve of Passover readily finding contraband but unable to find a Jew in possession of chametz (leavened products), allowing him again to extol the virtues of the Jewish people who are fearless of the armed policemen in the market but who would never think of harboring chametz.
. . . And the Holy One, blessed be He, in His infinite mercy and kindness, who desires the rectification of those who return before him with truth and love, who desires not the death of the sinner but rather the return from his sins, during this holiday [Sukkot] within which we come to seek refuge in the shade of the Almighty by virtue of the mitzvot and other good deeds borne of love for G‑d, may He be praised, enumerates then the transgressions in order to know how many mitzvot will arise from these transformed transgressions. Unlike the period preceding Sukkot where teshuvah is motivated by fear and thus the transgressions are not counted at all as they are [effectively nullified and] considered inadvertent transgressions; however by Sukkot which is motivated by the love of G‑d, then G‑d Himself counts and enumerates the transgressions so that they be transformed into merits and that they should then serve as worthy intercessors on behalf of Israel. This lesson is immortalized in the famous story in which the Berditchever was walking on the street when he encountered a banker who had strayed far from the path of his ancestors. The Berditchever stopped and exclaimed, “I envy you—you possess such vast potential spiritual riches. When you come to teshuvah, the stains on your soul will become brilliant sources of light with which you will illuminate the world.” Indeed it was in the realm of the “other good eye” with its potential for untold spiritual wealth that the Berditchever truly found his voice. The holy Baal Shem Tov urged us to consider the teachings of the Torah not as “once upon a time” stories from days gone by, but rather to internalize its lessons and stories as part of a living continuum predating the giving of the Torah at Mount Sinai. I can almost feel the Berditchever cupping his hand over my “other good eye,” my “good eye” welling up with tears…I’ve had several memorable “Berditchever moments” over the years. In 1976 I traveled to Israel for the first time. Upon arriving in Tel Aviv, I somehow ended up in a local hotel for a breakfast buffet. When the waiter brought the milk for my coffee, I accidentally spilled the milk into the coffee cup, causing it to rise over the rim of the cup. The waiter, a non-observant Israeli, began to berate my carelessness. “Mah, ata oseh kiddush?”—”What are you doing, making kiddush?” I recall thinking at that moment just how wonderful it was that even while berating me, his point of reference was kiddush! Similarly, for the past several years I have had the pleasure of serving as rabbi in a small Orthodox synagogue in rural Connecticut founded over 100 years ago by Jewish farmers. Several of the remaining congregants still farm as did their parents and grandparents before them. Candidly, there was a point in my life when I would have been extremely put off by their coming to synagogue on Yom Kippur in overalls and soiled t-shirts. Yet, as these simple Jews file in to the synagogue on Kol Nidre eve, coming directly from the fields in their work clothes, I can almost feel the Berditchever cupping his hand over my “other good eye,” my “good eye” welling up with tears and allowing me to see nothing but the pure hearts of these simple Jews who lovingly tread in the footsteps of their ancestors before them. So as we enter a new year and especially the 200th anniversary of the passing of Rabbi Levi Yitzchak, let’s try to focus on seeing life through the “good eye.” And if for any reason we have difficulties accessing the “good eye,” well then, there is always the “other good eye” to fall back on. Posted in memory of Yitzchak Eliezer b’r Shmuel Chaim Shalom whose Yahrzeit was on 27 Tishrei. Reprinted by permission from the Five Towns Jewish Times. Naflah ateres rosheinu. 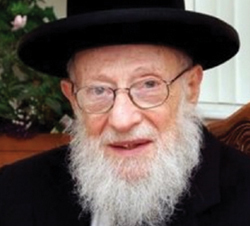 On Tuesday of this week, Klal Yisrael lost one of the last great rashei yeshiva and ba’alei mussar of the previous generation, Rav Alter Chanoch Henoch Leibowitz, zt’l. The loss is indescribable. Rav Leibowitz was the only son of his saintly father, Rav Dovid Leibowitz, zt’l, founder of Yeshiva Rabbeinu Yisroel Meir HaCohen, commonly known as Yeshiva Chofetz Chaim. The yeshiva was first established in 1933 by Rabbi Dovid Leibowitz, a nephew of the Chofetz Chaim. On December 7, 1941, Rav Dovid Leibowitz passed away, and his son would take over at the helm of the yeshiva. Slowly but surely, Rav Henoch Leibowitz shaped and molded his talmidim to be talmidei chachamim as well as mentchen. He imbued them with a sense of mission to do and work for Klal Yisrael. The greatest achievement for one of his talmidim was to merit to be a marbitz Torah in Klal Yisrael. And harbatzas Torah they did. Rav Henoch Leibowitz’s talmidim opened up high schools across the nation and beyond—in Miami, Los Angeles, Rochester, Milwaukee, and Ottawa, to name just a few. Rav Leibowitz nurtured his talmidim and the mosdos they set up. Soon, Chofetz Chaim became a major force in American Judaism. Entire Torah communities were to spring up around the Chofetz Chaim branches. These communities yielded fruit. Many graduates of the Chofetz Chaim schools entered harbatzas Torah themselves, in every capacity. The attitude of Rav Henoch’s talmidim created a major turning point and shift in the field and in the public perception of Jewish education, which affected all other yeshivos, as well. A career of harbatzas Torah became a lofty profession, something that the elite should aspire to achieve. Rav Leibowitz focused his efforts on developing his students in three major areas. He felt that mechanchim—indeed, everyone—should strive to achieve the highest level of iyun (in-depth study) possible. Toward this end, Rav Leibowitz spent countless hours with his students, teaching them how to unfold the latent processes of reasoning in a Talmudic text. He taught them to highly esteem the words of the Maharsha and to home in on the essence of an argument between the Maharam and the Maharsha. And he taught his talmidim to appreciate the words of the Acharonim, too. The second area in which Rav Leibowitz “grew” his talmidim was in the area of mussar thought and texts. Talmidim were taught how to develop a genuine mussar insight, either in psychology or midos or some other area of Torah growth. Such insight, of course, also had to be logically and textually compelling. The true “Slabodka shmuess” was not a d’rush-filled exposition of any Torah thought that comes into the talmid chacham’s mind; no—it had to be derived from a previous Torah text: a Ramban, a Seforno, a Rashi, a Midrash. Otherwise, the integrity of Torah could be compromised, if people’s own ideas were read into the text and represented to the world as Torah. Thirdly, Rav Leibowitz imbued his students with a sense of mission toward Klal Yisrael. His talmidim were in the forefront of chinuch and the revitalization of Torah throughout North America. His students opened Torah institutions and branches in many cities, including Los Angeles, San Diego, St. Louis, Cherry Hill and Manalapan (New Jersey), Cedarhurst, Huntington, Monsey, New York City, Vancouver, Ottowa, Phoenix, and Dallas—and in places in Eretz Yisrael, too. He personified the midah of emes, as well. Once, for example, a wealthy individual gave a $10,000 donation that was doubled by his corporation’s matching-funds program. The problem was that the donor’s check did not clear. Rav Leibowitz promptly refunded the corporation’s money. Any behavior otherwise was sheer anathema to him. He was a genuine Torah sage in every way, and he would never countenance any form of dishonesty, chalilah. Rav Leibowitz had a warmth and a smile that conveyed his love for each member of Klal Yisrael. He also had a great sense of humor, which he utilized to connect with talmidim, baalei batim, and other members of Klal Yisrael. Once, when my mother, aleha ha’shalom, met him, she asked him to compile the Kabbalistic writings of her father, grandfather, and great-grandfather. For the next four weeks, he playfully teased me about it, but it was a loving, playful tease that served to connect. When I, a boy from California with no family in New York, had surgery during my first year in yeshiva, he and his rebbetzin put me up in their house to recover. His rebbetzin, zt’l, served me her nurturing kasha, chicken soup, and kosher jello, and Rav Leibowitz patiently sat and learned with me. Rav Leibowitz personified the idea of sensitivity toward others and making sure that people realized what it means to cause anxiety to others. A typical shmuess of Rav Leibowitz involved examining Rashi’s comments regarding the person who cursed the name of Hashem, found at the end of Parashas Emor. The pasuk says, “Vayanichuhu ba’mishmar,” they placed him under guard. Rashi comments: “Alone—and they did not leave the person who gathered [sticks] with him.” Why? Rashi explains that even though they both committed their sins during the same time period, one of them, the gatherer of sticks, incurred the death penalty; they just did not know which particular death penalty. But regarding the one who cursed G-d, they did not know what his punishment was to be at all. Rav Leibowitz asked, how does this difference explain why these two prisoners were housed separately? He answered that they were placed in separate locations to avoid the additional anxiety that the one who cursed G-d would feel if he observed that they housed him with someone who incurred the death penalty. How sensitive we must be to each tzelem Elokim, if even a criminal deserves this sensitivity. The lesson is even more profound when we examine the words of the Da’as Zekeinim. From there we see how particularly heinous the blasphemer who cursed Hashem actually was. And yet we see that we should be sensitive to his anxieties. Rav Leibowitz, zt’l, was one of the gedolei ha’dor who personified the highest ideals of the Torah—in his words, deeds, teachings, and actions. His impact on Torah in America will be felt for centuries to come. The loss to all of us is most profound.